A first appearance on Live and Loud! 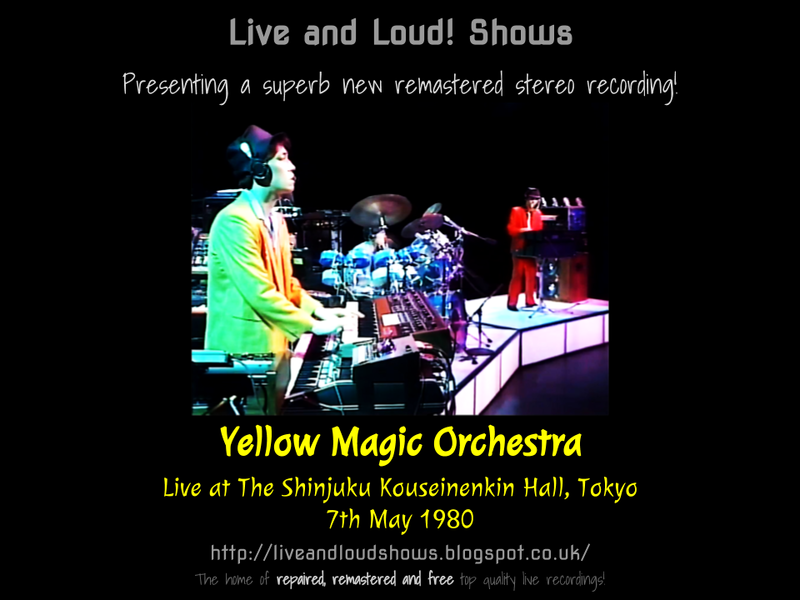 for Yellow Magic Orchestra. This was a very flat and lifeless sounding recording of 2 separate broadcasts from Japanese radio from 1980, where the radio station played this gig in 2 halves (1 week apart), interspersed with quite a lot of talking and adverts for "Fuji Cassetto!" in between tracks (the show was sponsored by Fuji). I could have left all that in - but sometimes the monologues went on for several minutes and unless you understand Japanese it wouldn't necessarily hold your interest for very long! So I decided to remove all that and edit the show as 1 continuous live recording. It took quite a few hours to do but was worth it, I think. After that, I reduced the tape hiss and then some judicious use of the 30 band EQ has improved the sound quality a lot. The sound quality is really good now, although the first track or 2 still does sound a little flat, compared to the rest. The show is available for free download here as 1 MP3 file. Or, if you would like to have separate tagged MP3s, or even lossless files in FLAC format, head on over to the Donations tab to see how you can obtain these for a very small donation towards the site costs. If you're on Facebook, why not keep uptodate with news on what shows are coming up and other information by searching for "Live and Loud Shows" on there and joining the group or page? lol, no probs - cheers!